Quick Disconnect Set — This set includes both male and female parts and is used primarily to connect the compressor to the airbrush hose on larger compressors. This allows for easy removal and connection, and completely shuts off the airflow when disconnected. Its quick-release action makes changing airbrushes fast and easy. It is rated for air pressure up to 120 PSI. 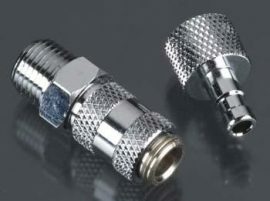 This adapter is the male connector part of the Quick Disconnect Set that attaches to the airbrush hose. Attach to your compressor and airbrush hose and atta then purchase additional adapters to attach to each of your airbrush hoses.